suspensions consist of solid axle (tubular axle on 2WD), 4 control arms, 2 coil springs and track bar. Track bar is used to minimize front axle side-to-side movement. Stabilizer bar and shock absorbers control suspension spring movement. Grand Wagoneer and Wrangler models use leaf spring front suspension with shock absorbers and stabilizer bar. Wrangler also uses a track bar to maintain lateral position of front and rear axles. See WHEEL ALIGNMENT SPECIFICATIONS & PROCEDURES in WHEEL ALIGNMENT section. NOTE: Bearings should be cleaned, inspected, replaced (if necessary) and lubricated before adjustment. CAUTION: Never preload tapered roller bearings or damage to roller ends will result. Bearings are designed to have a slightly loose feel when properly adjusted. bearings are thoroughly packed with lithium grease. retainer nut to 17-25 ft. lbs. (23-34 N.m) to seat bearings. cotter pin. Clean hub dust cap and coat inside with clean grease. Reverse removal procedure for remaining components. hubs, remove hub dust cap and drive gear snap ring. See Fig. 1.
nut to 50 ft. lbs. (68 N.m) while rotating wheel. assembly. Pry grease seal from hub. Remove inner wheel bearing. Clean bearings and hub in solvent and dry with compressed air. Inspect bearings and races for wear. To install, reverse removal procedure. Adjust wheel bearing. See WHEEL BEARING under ADJUSTMENTS in this article. hang on brake hose. Remove rotor from hub. remove hub dust cover and drive gear snap ring. See Fig. 1. To install, reverse removal procedure. Adjust wheel bearings. See WHEEL BEARINGS under ADJUSTMENTS in this article. steering knuckle. See Fig. 1. Ensure hub, bearing carrier and wheel bearings are packed with clean lithium grease. Reassemble hub assembly using new grease seal. Reverse removal procedure. Tighten bolts to specification. Install new cotter pin. Fig. 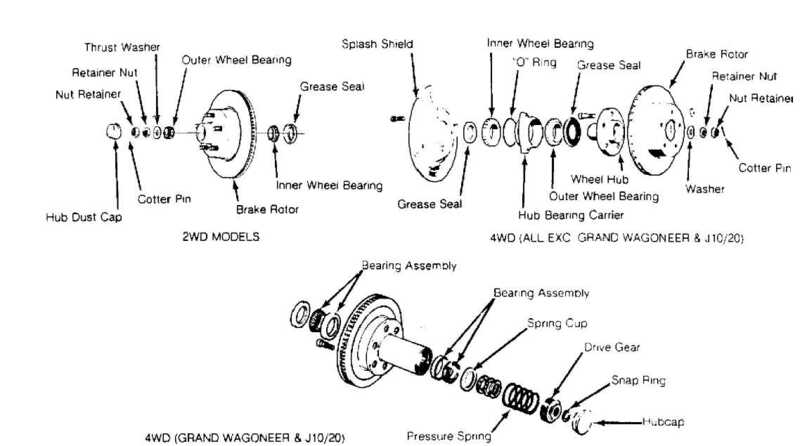 1: Exploded View Of 2WD Hub/Rotor Assembly & 4WD Hub/Bearing Carrier Assembly Courtesy of Chrysler Motors. hub/bearing carrier assembly. See WHEEL BEARINGS in this article. remove right axle shaft, disconnect vacuum harness from shift motor. Remover/Installer to remove split ring seat. Fig. 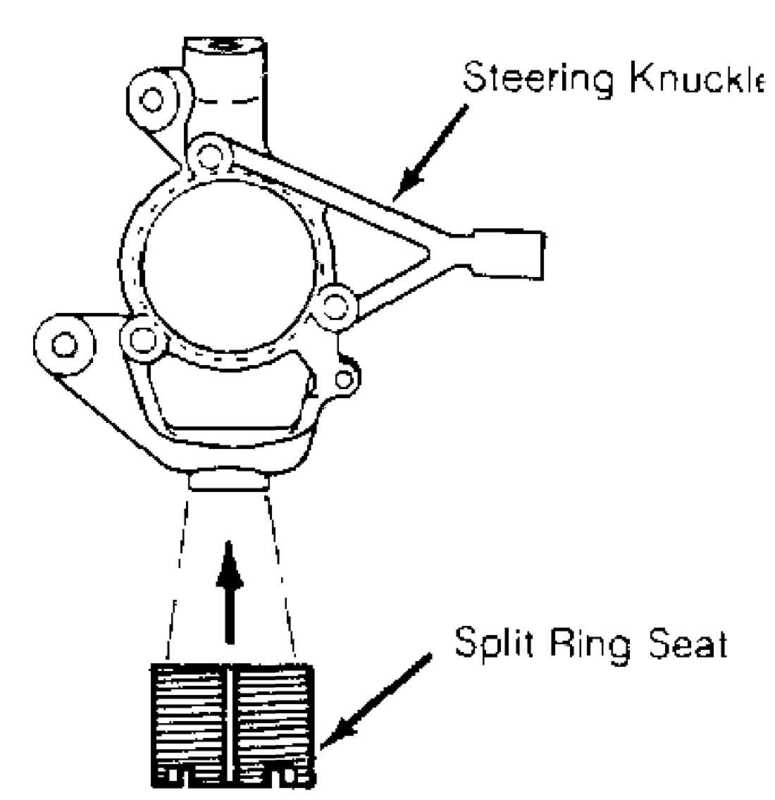 2: Determining Steering Knuckle Split Ring Seat Position Courtesy of Chrysler Motors. depth of .206" (5.23 mm). with collar. Tighten all bolts to specification. excessive wear. Replace as necessary. upper ball joint. Place Adapter (J-34503-3) in "C" Clamp (J-34503). remove ball joint. See Fig. 3.
of clamp. See Fig. 3. Install "C" clamp, adapter and receiver. Tighten "C" clamp to remove ball joint. See Fig. 3.
housing bracket, over installer and ball joint. Tighten "C" clamp and fully seat ball joint. See Fig. 3. Fig. 3. Tighten "C" clamp to install ball joint. Ensure ball joint is fully seated. Reverse removal procedures for remaining components. Tighten bolts to specification. Fig. 3: Removing & Installing Upper & Lower Ball Joints Courtesy of Chrysler Motors. lower control arms at axle housing. bracket (if equipped). Disconnect center link at pitman arm. spring retainer mounting bolt, then remove retainer and coil spring. Note component locations for reassembly reference. NOTE: Coil springs are rated separately for each side of vehicle depending on optional equipment and type of service. Ensure springs are marked for installation in original positions. control arms to axle housing. Raise and support vehicle. Raise axle assembly with jack to relieve spring tension. On Wrangler models, loosen stabilizer bar link nut. On all other models, remove stabilizer bar. Remove spring "U" bolts and plate. Disconnect front and rear shackles from frame. Lower spring assembly. To install, reverse removal procedure. Remove upper control arm mounting bolt from axle housing. 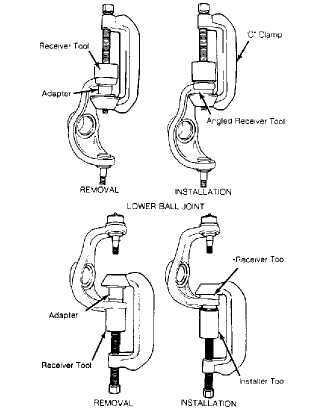 control arm for damage or distortion and replace as needed. deterioration or wear. If bushing replacement is necessary, install Spacer (J-33581-3) between ears of control arm bracket on axle housing. See Fig. 4. NOTE: Spacer is not used on axle housings with solid control arm brackets. CAUTION: Do not attempt to remove upper control arm pivot bushing without spacer. Tool is designed to support bracket and prevent distortion during bushing removal. J-35581-2, Receiver J-35581-1, Bolt J-21474-19 and Nut J-21474-18) onto pivot bushing. See Fig. 4. 5) Rotate nut to press bushing from axle housing and into receiver. See Fig. 4. Once bushing is removed, remove bushing remover/installer set but leave spacer in position for new bushing installation. arm bracket. Assemble remaining installer components. See Fig. 4.
seated in bore. See Fig. 4. Remove bushing installer components. Fig. 4: Removing & Installing Upper Control Arm Bushing Courtesy of Chrysler Motors. distortion or wear. Replace control arm and/or bushings as necessary. Position lower control arm in front and rear brackets. Install mounting bolts and nuts. Tighten mounting bolts to specification. nut at frame rail bracket. Remove retaining bolt at axle housing bracket. Remove track bar. Inspect track bar and bushing for damage or wear. Replace as needed. 2) If a snapping noise was noted at the front of vehicle, inspect track bar bushing inner sleeve for signs of wear. If sleeve has been contacting axle bracket, spread bracket flanges approximately 1/8" to provide space for a Hardened Washer Part No. (G2436163). spacer/washer between rear flange of bracket and track bar bushing. DO NOT install spacer/washer at the front of bracket. bracket. Tighten ball stud mounting nut-to-frame rail bracket. Tighten all bolts to specification. Install new cotter pin. Disconnect stabilizer bar from frame rail brackets. bushings and bracket supports for distortion and/or deterioration. Replace worn components as necessary. washers and rubber grommets on links. stabilizer links. Tighten mounting bolts to specification.